According to The Apostle Paul: Speaking in unknown tongues is good. "For he that speaketh in an unknown tongue speaketh not unto men, but unto God: for no man understandeth him; howbeit in the spirit he speaketh mysteries... He that speaketh in an unknown tongue edifieth himself... I would that ye all spake with tongues..."
Not all in the Corinthian Church spoke with tongues. Because, if they did, Paul wouldn't have said: "I would that ye all spoke with tongues." Notice that, even though some didn't speak with tongues, Paul still included them in the Corinthian Church. Some fellowships today could learn a lot from The Apostle Paul. Additionally, according to The Apostle Paul: Prophecy is good. Interpretation of tongues is good. And, both of these are even better than simply speaking in tongues. "...But he that prophesieth speaketh unto men to edification, and exhortation, and comfort... He that prophesieth edifieth the church. I would... rather that ye prophesied: for greater is he that prophesieth than he that speaketh with tongues, except he interpret, that the church may receive edifying." Like with tongues, not all in the Corinthian church prophesied. Because, if they did, Paul wouldn't have said: "I would... rather that ye prophesied." Notice again that, even though some didn't speak prophecy or interpret tongues, Paul still included them and encouraged them in the Corinthian church. 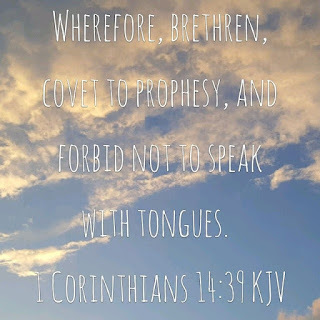 Likewise, The Apostle Paul included and even more so encouraged those speaking in tongues, those speaking prophecy, and those interpreting unknown tongues in the church. In this way also, some fellowships today could learn a lot from The Apostle Paul. Of course: "Let all things be done decently and in order." So, in conclusion: Prophecy is good. Speaking in unknown tongues is good. Interpretation of tongues is good. Not everyone is expected to do these things to be a part of the church. However, these acts (the acts of speaking in unknown tongues, prophecy, and interpretation of tongues) should not be forbidden, but rather encouraged. It's not the act that matters, it's the edification. It's not the work, but the result, that is needed. The need is met through the act. The act need be encouraged. He that prophesieth edifieth the church..."
The body of the church needs to be edified! The Apostle Paul gave everything he had into this single purpose: The edification of the living body of Christ Jesus - the edification of the church! "Follow after charity [love], and desire spiritual gifts, but rather that ye may prophesy... Even so ye, forasmuch as ye are zealous of spiritual gifts, seek that ye may excel to the edifying of the church." "(the act of) building, building up"
"the act of one who promotes another's growth in Christian wisdom, piety, happiness, holiness"
CHURCH: Be encouraged to EDIFY one another. Imitate Paul The Apostle as he imitates Christ Jesus (ref. 1 Cor. 11:1) Christ is our perfect example. Be like Christ. A link to the above information in a one-page printable and shareable PDF is HERE.